John Mayer is releasing his new LP, The Search For Everything, in 4 song parts and today, he has released the first - Wave One. It's an unusual move for Mayer, a conventional major artist who typically releases full-lengths at once, to release an EP, but apparently this was inspired by artists like Drake and Rihanna, he told Rolling Stone. When listening to the group of songs, the first track "Moving On and Getting Over" is an obvious standout. 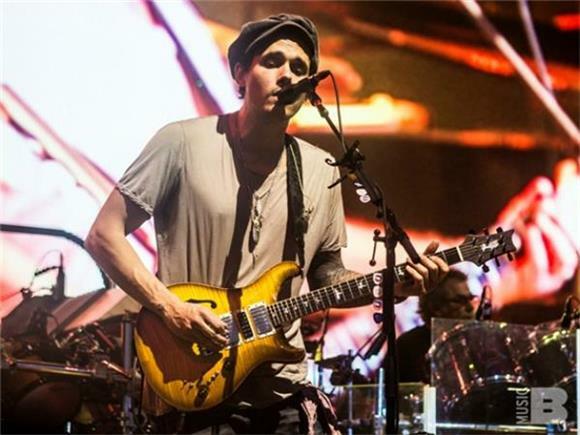 The instrumentation is sparse, and instead of Mayer wailing a solo on his guitar (which we know he is very capable of), he uses the instrument to instead create a delightful 2-part groove, a bit reminiscent of his Continuum days. It sounds like classic Mayer, yet there's something so new and daring about it... The rhythm continues throughout the entire song and ends with a subtle but uplifting jam, which is meant to symbolize the fact that, although he is going through a breakup, he is actually getting over it. "If I'd had to finish this song a year ago, it wouldn't have this ending. This ending is me coming back to it two years later and going, 'I've moved on, so it gets a happy ending,'" he continued to tell Rolling Stone. It's hard not to love Mayer. For reasons hard to explain, he manages to deliver a sense of nostalgia, even with brand new songs that have never been heard before. Perhaps its his voice, the same one a lot of us grew up with. Maybe it's his soothing guitar licks, complex but seemingly simple at the surface. Whatever it is, we can always take comfort in Mayer and his music, and we can't wait to hear the rest of the album.